Our dynamic platform and robust features can help you build the powerful web presence you deserve. Fade, zoom or slide content using different animation styles. Use shadows to add depth to objects throughout your website. Produce smooth color transitions that add visual impact. With liveBooks’ advanced image compression tools, you have the ability to fine tune the quality of your images. With your liveBooks website, you can easily create password-protected proof sheets for clients to access. Image hover effects allow your title and descriptions to display on top of images when a user hovers over them. Our partnership with Typekit allows you to use the highest quality fonts for free. The SEO tab makes it quick and easy to add Alt-title and description to images, which improves your search results. Easily password protect pages or enitre sections of your website. You can customize the mobile navigation and mapping setting of your already mobile-friendly website. All SpaceCraft websites include HTTPS, the most secure protocol available for websites today. liveBooks hosts your images and reduces load times by taking advantage of content delivery networks around the globe. Customize and style each individual page within your website. 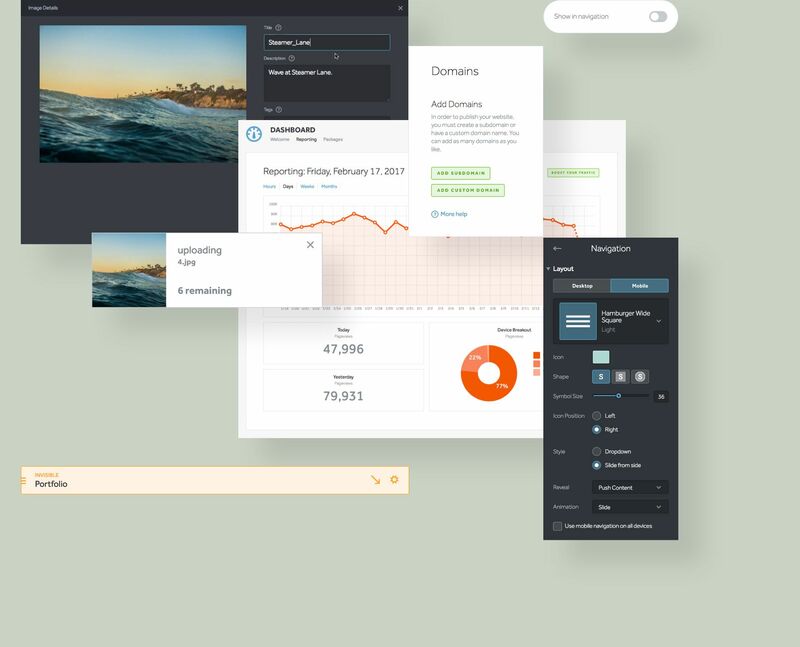 For a more visual experience, edit your content directly within the design view of your website builder. Save all of your work as you go. Our website builder has an auto-save section which ensures your hard work is safe. Preview your website in Desktop, Tablet and Mobile mode, all within your website builder, before you share it with the world – just click the preview buttons. Add as many content modules as you like. You can pick from our pre-configured modules in your website template or create your own by combining our image galleries, videos or text blocks. liveBooks offers multiple presentation styles for your images, including grids, slideshows, and stacking. Ability to add your videos from Vimeo and YouTube; just copy and paste the embed code in your website builder. Easily move content sections, items and images to create a perfect website. No need for file attachments; just drag and drop your images directly from your desktop to your browser. Quickly add title tags, descriptions, keywords, image alt text and more to your website so that your site is easily searchable and indexed properly. Add unlimited images to your galleries, then quickly design and customize their layout in your website builder so every single one looks great on the page. Easily add titles, descriptions, credits and tags to every image on your website. You will have the ability for infinite customization with advanced developer tools so that you can make and add custom HTML/CSS to your website. Ability to add multiple user accounts with separate roles – Administrator, Content Editor, and Designer – allowing you to set up the right permissions for each user. Quickly add Google Analytics, Clicky, GoSquared, StarCounter, and more to track your website traffic. Plus, add your Wufoo or FormStack forms directly into your liveBooks website – no coding required. You'll have the ability to add redirects from your existing website URLs to your new liveBooks website so that users do not receive error messages for bookmarked pages or search results. We’ve built an online knowledge base with help guides, tutorials and videos.